Done! 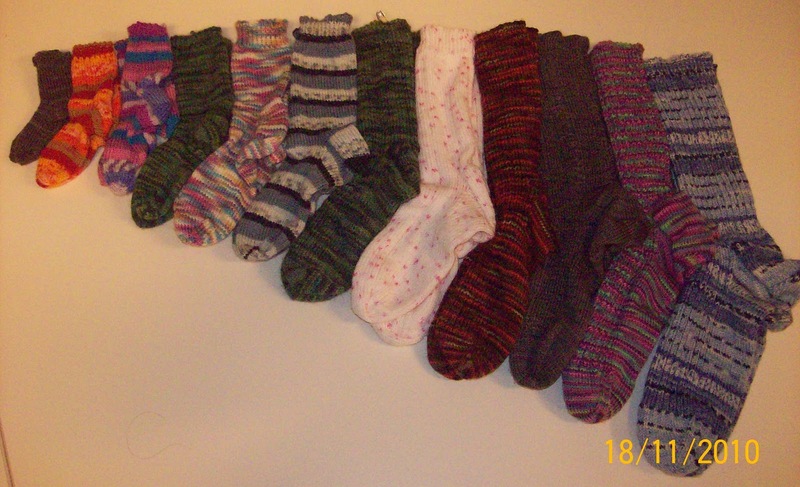 A complete set of socks, made from my adapted pattern! Updated 18 November. What I wanted was ONE pattern for all sizes. And, this is it... You can also download a PDF copy here. Adapted from various books, but mainly Knitted socks: over 25 designs for fab feet and cozy toes for the whole family by Anna Tillman. Trying to figure out the sizing was a bit of a pain! Shoe sizes are NZ-sizing. TBL: through back of loop/s. This twists the stitch, so it leans the other way. Foundation row: *K2 tog, p1; rep from * to end. This gives a more elastic cast on edge. BXS: work 3 rounds of K1, P1 rib. Baby sizes BS-BXL: work 5 rounds of K1, P1 rib. Child and adult sizes: work 11 rounds of K1, P1 rib. NB: you might like to try moss stitch instead of rib, for a different look. Or the length you want. You can work whatever pattern you like, as long as it works with the number of stitches – so a 2-stitch or 4-stitch pattern will generally work. If you use a self-striping, or variegated sock yarn, simple stocking stitch (every row knit, because you’re in the round) will work really well and look effective. You could try cables; K2, P2 rib; moss stitch [ie knit the purl, and purl the knit stitches in the next round – also called Seed Stitch]; K3, P1; or blackberry stitch: round one: *(K1,P1,K1) into one stitch, P3 tog, rep to end; round two: *P3 tog, (K1,P1,K1) into one stitch, rep to end. Note: this makes a tighter-fitting sock. NB: this total includes Rounds One and Two above. NB end with right side (knit) row and DO NOT TURN. NB for some sizes, the final two rows do not have the P1 / K1 at the end. Knit across stitches from cuff (those on spare needles): NB: if the pattern you used on the cuff is quite flat, you can continue it on these stitches. This makes up the top of the foot. This means the beginning of the round is back in the middle of the sock. Round Two: Knit. NB for a neater finish, when you get to the decreased stitch made by K2 tog tbl, knit through the back of this stitch, so the stitches angle the correctway. NB for a neater finish, when you get to the decreased stitch made by K2 tog tbl, knit through the back of this stitch, so the stitches angle the correct way. If everything has gone to plan, the stitches before your first marker – and after your last marker – should be the number listed below to rearrange. To make rearranging the stitches easier – when you have finished the last knit round, just continue past the round marker, and then use the same needle to knit to first marker. and last sts [as below] are on one needle, with the remaining (middle) stitches on another needle. At each end of each needle, slip the first stitch over the next stitch on the needle. Graft the remaining stitches together using Kitchener stitch. A good tutorial on Kitchener stitch is on this page - just scroll down a bit. Random balls of yarn - or remnants. Garter stitch (ie, every row knit) with colour A until you get bored. Join on another yarn,and chop off colour A and garter stitch that until you're bored. Repeat until it's long enough. 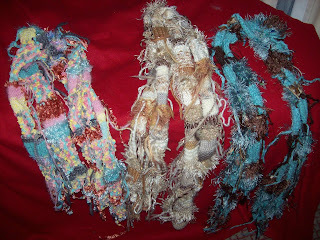 To stop the yarn possibly coming apart, tie a knot in the ends of the 2 yarns, and leave dangling. If you want to get fancy, you can do other stitches - but the size of the scarf and the different colours makes it a bit moot. There you go! Easy! Perfect project for the beginner knitter.